The Holy Quran (Summary): Chapter 111 Sūrat al-Masad - "The Twisted Strands (of Palm Fiber)" ~ Islam My Ultimate Decision . 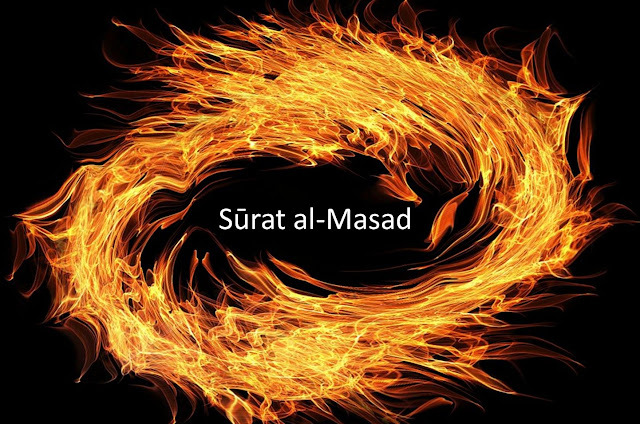 The Holy Quran (Summary): Chapter 111 Sūrat al-Masad - "The Twisted Strands (of Palm Fiber)"
Sūrat al-Masad is the 111th chapter of the Holy Quran and the only sūrah in which the name of the worst enemy of Islam and Prophet Muhammad (peace be upon him) is taken openly: Abu Lahab. And because of this fact, this sūrah is commonly known as Sūrah Lahab. Abu Lahab was one of the four paternal uncles of Prophet Muhammad (peace be upon him) and was right from day one of his nephew's open call for Islam has been treacherously against Islam and his nephew. The sūrah was revealed soon after one day Prophet Muhammad (peace be upon him) gave a call to all tribes of the Makkah while standing on the top of Safa, a hill just on the outskirts of Makkah. Prophet Muhammad (peace be upon him) is said to have called all tribes by name so that no one is missed out for he was about to proclaim Islam openly. The whole assembly unanimously said: "Certainly we will believe, for thou hast never told a lie”. “Then", Prophet Muhammad (peace be upon him) gave them an open invitation to join the religion of Islam, "I have come from Allah as a warner to preach the Unity of the Lord". Hearing this, Abu Lahab is said to have exclaimed: "May you perish! Is it for this that you have gathered us?" On this, Allah revealed this surah as reply to the disgraceful words uttered by Abu Lahab, with the warning, that later became true: May the hands of Abu Lahab perish, may he (himself) perish. “May the hands of Abu Lahab perish, may he (himself) perish ". “His wealth avails him not, neither what he had earned". One day Abu Lahab asked Muhammad: "If I were to accept your religion, what would I get?" Muhammad replied: "You would get what the other believers would get." He said: "Is there no preference or distinction for me?" Muhammad replied: "What else do you want?" Thereupon he said: "May this religion perish in which I and all other people should be equal and alike!". “The Day whereon neither wealth nor sons will avail,""But only he (will prosper) that brings to Allah a sound heart". Thus this sūrah also makes a mention of twisted strands of Palm Fiber that in Hellfire shall be twisted around the neck of the wife of Abu Lahab, for the reason that she took great pride in wearing an ostentatious necklace she became known for and would slip by night to strew thorns and prickly plants in the Prophet’s path to injure his feet. As for the fate of Abu Lahab, it is said that "He died from a contagious disease and since his body gave off an unbearable, foul smell no one approached it. 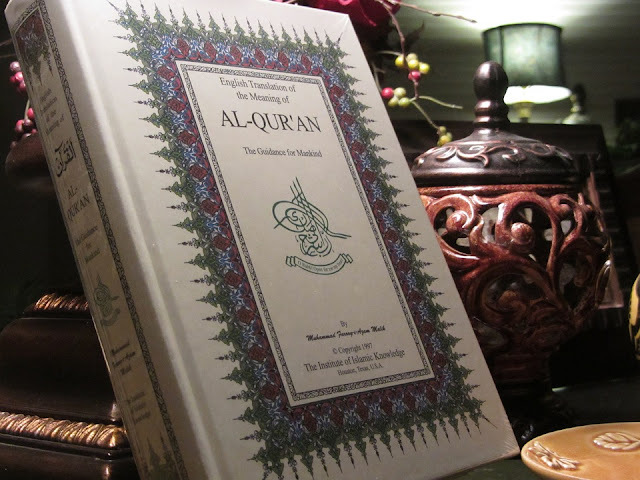 It was left for three days and at last, some slaves were hired to carry it out of Makkah. They watered it from a distance and then piled stones on top of it until it was buried."